PONTIAC ZONE TECH FORUMS - Dynoed a 413 tonight. What a beast for a street car! Dynoed a 413 tonight. What a beast for a street car! 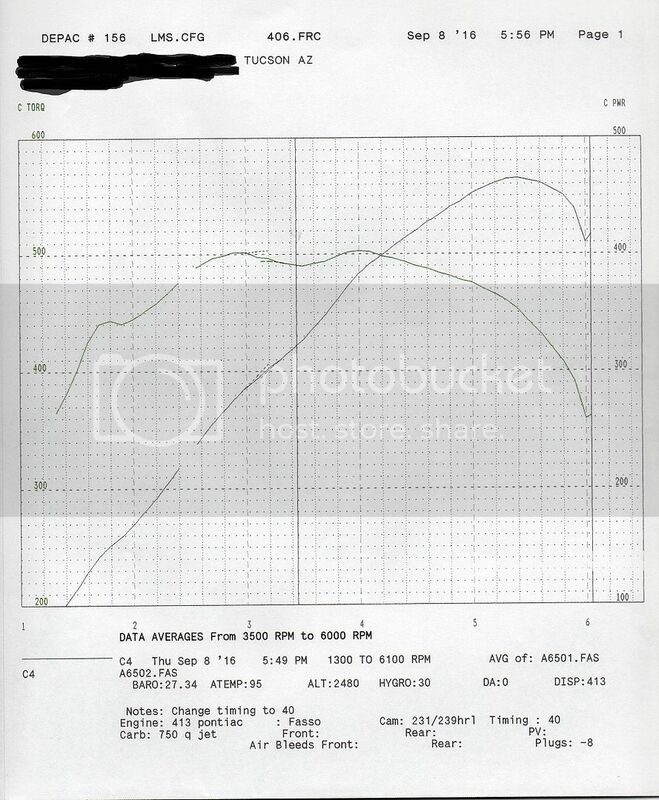 Dynoed a 400 tonight that is .065" over. It is 413 CID. It has ported iron heads, un-ported iron intake, points distributor, and a Voodoo hydraulic roller cam. 10.1:1 compression, and run on 91 octane pump gas. It is a build for a guy on another board. Here is a link to the build if you're interested. OK, so we get 'er dynoed today. I was pleasantly surprised. Here is how it was dynoed. 1. Points distributor with Blue Streak points. 2. Cliff built 1967[I believe] Q-jet. 6.5 lbs. fuel pressure[was 5.7 lbs. but somehow crept up to 6.5]. 3. Stock 1971 iron intake. Unported, as cast. 4. Crappy 3 tube Cyclone headers, no mufflers, w/ 6" diameter pipe slipped over collector to vent exhaust outside. 5. 91 octane pump gas. Just to refresh, this is a 413", 10.1:1 compression, 67 GTO engine. It has CNC ported 670 heads from Dave @ SD Performance. RPM 5140 rods, and CP flat top .065" over pistons, with Steel gas nitride top ring, Napier second ring, and low tension oil ring. Stock crank, .010"/.010". The cam is a Lunati VooDoo hydraulic roller, 231°/239° @ .050". Ground on a 110" LSA. Install on a 103.25 ICL. Lifters are Hylift/Johnson. First off, we hit the button, and it fired up within 2 seconds. Instantly idled, but just a tad low so I set it up to around 850-900 RPM. 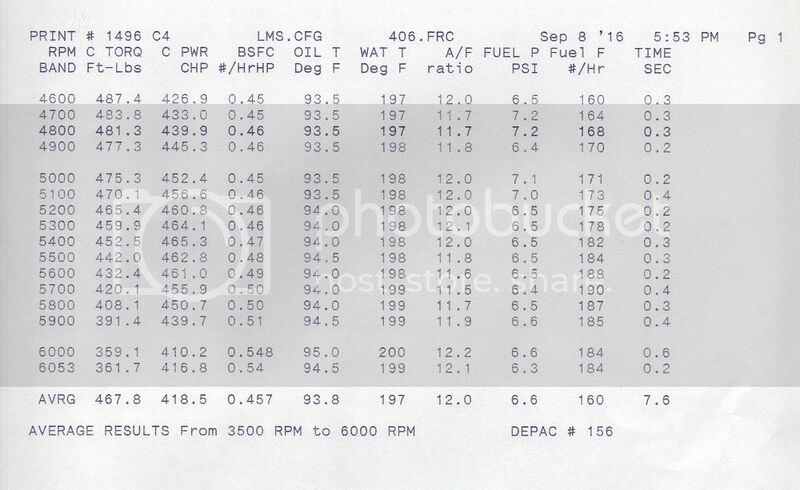 Engine had a steady 60 PSI oil pressure. Set total timing at 36° BTDC, not knowing what these heads would want after the mods Dave did to the chambers. Heard no audible detonation. Plugs looked good. I predicted about a week ago that it would make 453 HP, and 482 ft. lbs. of torque. First pull it made 447 HP, and 484 ft. lbs.! Bumped the timing up to 38°. It made 456 HP and 494 ft. lbs. Still heard no detonation, and plugs looked good, with no visual signs of detonation, and looked to be burning about right[not too rich, not too lean], so we bumped the timing up to 40°. It made 465 HP, and 503 Ft. Lbs.! Look at the torque down at 1500 RPM! For a pump gas 400, this thing is a torque monster! 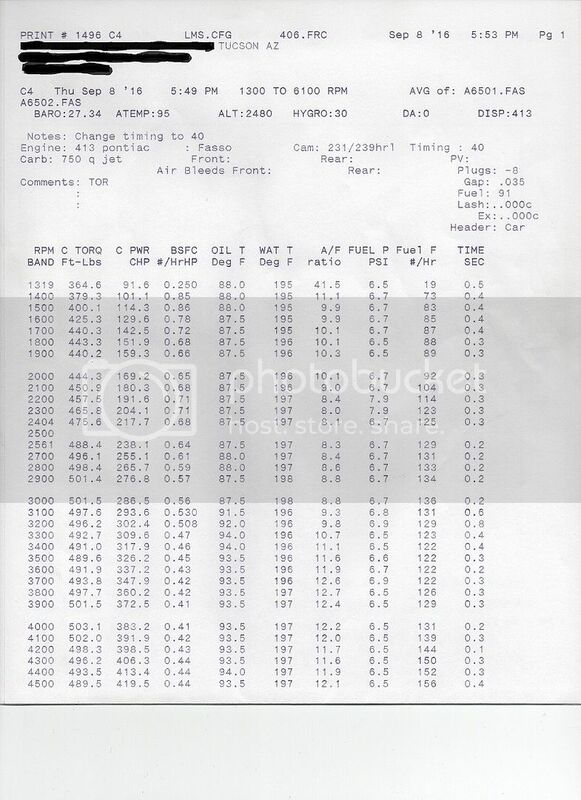 Here is the dyno sheets. The guy finally got new ink cartridge so now the sheets are dark enough I can scan them and still read them. Paul that's a killer street motor. Nice ! Here is a video of it idling at around 850-900 RPM. Here is with 38° total timing. Listen closely, and you can here the lifters reach their RPM limit right at 6000 RPM. Here is with 40° total timing. Here is the last video. This is where he pulls it backwards to get numbers way down low. It is wide open throttle here, and he just keeps applying the water brake to slow it down. Notice how well mannered it is at 1300 RPM wide open. On the first half of the sheet the torque falls off from 501 a bit after 3000 rpm then 501 shows back up at 3900 rpm. Jetting/metering rods,secondary opening rate ,timing? Or is that just what the backwards pull does? I'm not sure what caused that. It could be the open headers, or the collector length, or the 3 tube design. I'm not really sure. There are a lot of variables that could do that. It did that no matter what the timing was set at. I just did the math, and from 2700-5500 RPM, this thing made an average of 487 FT. LBS.! Well, round #1 of further dyno testing is complete. I bolted on a CNC ported factory iron intake. Dummy me forgot to disconnect the vacuum advance unit when I set the timing the other day. Rechecked it today[yes, yes, without the vacuum advance hooked up], and it only had 18° of total timing. The dyno operator kept telling me that can't be right. There's no way it made that kind of power with only 18°. But that's what it was. So I left it there, and made a pull with the 91 pump gas to get a good comparison, and it made 470 HP. Only 5 more peak HP than the stock intake. It lost a little bit of torque too, so the average HP from 3200-5500 was only 2 HP better. But it did carry the peak HP out over several hundred RPM, to 5900, and up there, the ported intake made 30+ HP more than the stock intake. Set the timing at 36°, figuring now it's really going to make some power. It went from 470 HP with 18° timing to 473 HP. Tried 38° it lost power[made 465 HP]. Tried 34° it made 474 HP. Tried 32° and it made 479 HP over a 300-400 RPM range. I will get a printout tomorrow. It was getting late, and I forgot to get one. Tomorrow we will try the Victor intake, and Holley carb Jeff built. That carb is a 750 HP, that flows 999 CFM. I think I will try light lashing the rockers too to see if the lifters quit pumping up at 5900-6000. Real cool tests, thanks for sharing!! Ended up making 500 HP with a Victor intake and a 750 HP Holley that flows 999 CFM. That will be a fun ride!